I request here to post his palm. His trust value appears to be 2 and half lakhs crores rupees, plus, Total bank account balance is 40,000 crores rupees. He has many branch all around the world. just curious to see his palm lines. Infact, he born in ordinary family. Appreciate your efforts in posting his palm pictures. He died today at the age of 86. Yes, I heard as well the sad news that Sathya Sai Baba died earlier today. hi stalin, Thanks for informing us, I didn't know Sai Baba died today. I remember we looked at his hands years ago on another forum. Hello swami, What is your real name.. uneasy to use the word swami until i know them better. Thanx for the pictures. did you notice no marriage lines in his palm, plus, complete ring of solomon? how unique presentation of spiritualist hand it is! More than 3lakhs of peoples gathered for his funeral from all over the world, with in 2 days. Today, primeminister and ministers of india come today for his funeral at 4.pm. PS. 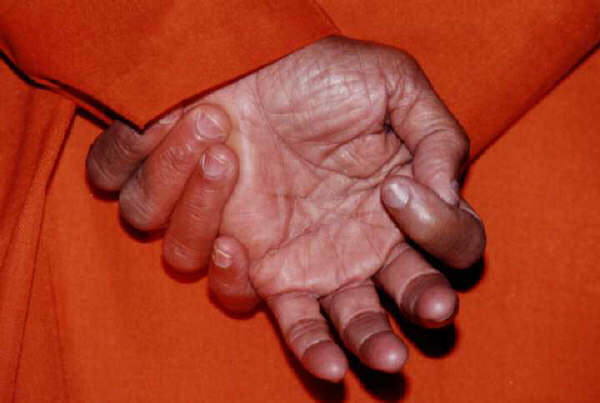 I think Sai Baba did have 'affection lines' in both hands, but the photos are not of sufficient quality to spot them clearly (though in various photo I can see them in especially his right hand, see also the photo below). Moreover, clear observation suggest that when he folds his finger slightly, his skin texture folds together and forms such illusion. other pictures are considerably good to verify this aspect. 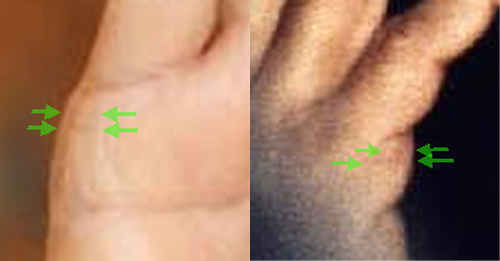 In the largest picture of his right hand (see my former post), he did not 'fold' his hand... but I see in the upper half above the heart line a clear short 'affection line' (and I see it clearly as well at the same location of the third picture; and in some of the earlier pictures that I posted a can see it vaguely). In general, photos are often not suitable to study the minor lines. And I think we should also be aware that in elderly people all lines typically become weaker - so beyond the quality of the photos there can be other reasons why we can not see those lines very well in some of those pictures. Thanks for sharing your thoughts again. Why do we switch on the light to check the visible facts? Let us check! Sure Stalin, we can let the visible facts speak for themselves! And let's see if others might be able to present better photos. From my collection @ 2001. Sad news of his died. Thanks Martijin, Patti and Swamijir for posting his hand prints. Sathya Sai Baba born as Sathyanarayana Raju (23 November 1926 – 24 April 2011) was an Indian guru, spiritual figure, philanthropist and educator. In 2011, he was listed by the Watkins Review as one of the 100 most spiritually influential people in the world. He was described by his devotees as a human incarnation of Shiridi Sai Baba spiritual saint and miracle worker. The apparent materialising of vibhuti (holy ash) and other small objects such as rings, necklaces and watches by Baba has been a source of both fame and controversy – skeptics consider these simple conjuring tricks while devotees consider them as signs of divinity. Sathya Sai Baba claimed to be the reincarnation of the spiritual guru, Sai Baba of Shirdi, whose teachings were an eclectic blend of Hindu and Muslim beliefs. Sathya Sai Baba established schools and colleges, hospitals, and other charitable institutions in India and abroad. The number of active Sathya Sai Baba followers was estimated in 1999 to be around 6 million, though adherents' estimates are far higher. Since there are no formal ties of membership, the actual figure may never be known. 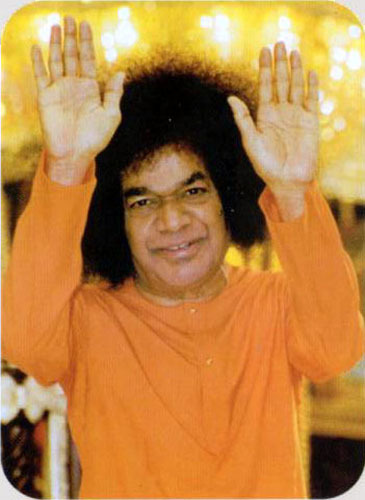 The Times Of India on 26 December 2000 said that Sathya Sai Baba "lashed out at his detractors in a rare display of anger" while referring to criticism published in a magazine. The Times quoted him as saying, "Jesus Christ underwent many hardships, and was put to the cross because of jealousy. Many around him could not bear the good work he did and the large number of followers he gathered. One of his disciples, Judas, betrayed him. In those days there was one Judas, but today there are thousands. Just as that Judas was tempted to betray Jesus, the Judases of today, too, are bought out to lie. Jealousy was the motive behind the allegations levelled at him". "Some people out of their mean-mindedness are trying to tarnish the image of Sai Baba. I am not after name and fame. So, I do not lose anything by their false allegations. My glory will go on increasing day by day. It will never diminish even a bit if they were to publicize their false allegations in the whole world in bold letters. Some devotees seem to be perturbed over these false statements. They are not true devotees at all. Having known the mighty power of Sai, why should they be afraid of the 'cawing of crows'? One should not get carried away by all that is written on walls, said in political meetings or the vulgar tales carried by the print media." Political figures offered their condolences, including Prime Minister Manmohan Singh and the Dalai Lama. Cricketer Sachin Tendulkar canceled his birthday celebrations The Hindu newspaper reported that "Sri Sathya Sai Baba's propagation of spiritualism and preaching of Hindu philosophy never came in the way of his commitment to secular beliefs. An estimated 500,000 people attended the burial. Anger is revealed by the presence of island on the Heart Line. I have many hands pictures where people do have affection lines but never got married due to one reason or the other. And remaining bachelor is indicated by self imposition by him; denoted by presence of horizontal lines on the ‘will’ part of the thumb. His focus was great with supreme self sacrifice. His teachings: Love All, Serve All, Help Ever, and Hurt Never. After finding thousands of crores of unexplained money and gold from his place.It makes me wonder what type of person he really is.The long Jupiter and sun finger almost reaching Saturn finger,long finger of mercury and thick lower phalanges all speaks volume of his personality which I need not say. ... But we can only speculate about what 'kind' of a man he really was. Anyway, I will remember him as a real-life 'illusionist' - who fooled around with the minds of his devotees. E.g. I remember a documentary from Belgium presented about 15 years ago where he was caught on camera doing a suggestive misleading 'trick' (doing a 'materialization' after taking an object into his hands). Afterwards some of his true devotees 'rationalised' the documentary - by claiming that this was only an ultimate 'test' of their belief in Sai Baba. 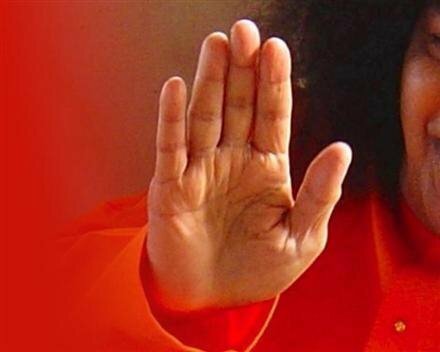 I am no follower of Shri Satya Sai Baba and my friend in another forum has posted so many negative posts about this person that I wrote to him and write here again what my Guru told me: Shri Satya Sai Baba had so many followers and how many do we have? If we are on the same level as Shri Satya Sai Baba only then we can speak on him. Secondly I had discussion with my Sadguru who spoke about Shri Satya Sai Baba and this is what HE said about the miracles performed by Shri Satya Sai Baba. Soniji (My Surname) woh ek hi bar jadu kar sakenge , Dubara nahin. 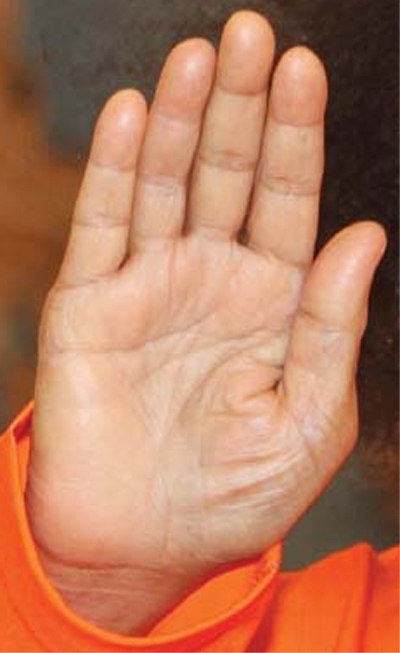 Translated into English: He (Shri Satya Sai Baba) will perform those miracles only once. He won't be able to repeat them. What my Sadguru had done in HIS life I know and miracles for these Greats are so easy as if it just happens and even though now HE is no more in body miracles continue to happen in my life through HIS blessings. I respect and love and adore my Guru and Sadguru and hence think it better to leave it at that. Classic example of hand, where Greatness is Thrusted upon a person.